Ms. Sandhya O. M., M.A., B.Ed. A child’s mind is like an empty vessel that needs to be filled with knowledge so that he can grow up to be a responsible individual. School, as we often say, is the second home to a child and this is where he begins to learn his reality. So the task of fostering creativity and a sense of lifelong learning into the young minds lies in the hands of teachers. Rather than teaching a child to walk steadily without tripping down, we, the SSRVM family, believe in strengthening his mind so that not only he doesn’t fear tripping down but also he is courageous enough to get up on his feet again and go ahead boldly. We don’t worry about what a child becomes tomorrow, but we believe in shaping and polishing him into someone today so that tomorrow is no longer a worry but a beautiful destination that awaits him. 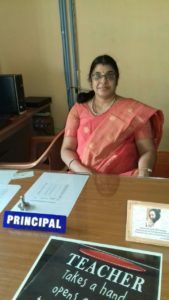 Our team at SSRVM Thrissur is devoted to motivate and enhance the ability of our children to critically understand, assess and question their own reality and ascend the stairs to enlightenment and wisdom.